The low limestone cliffs of the Bird Rock area. Although the start of the trail can be hard to find, this path travels through varying and scenic wetlands. 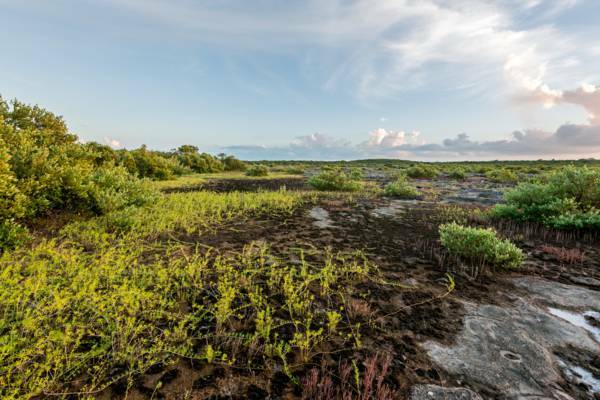 The salt-resistant plant life of the Bird Rock wetlands. Update February 2018: The trail is currently in an unkept and overgrown state. Unless you are an intrepid hiker used to off-trail hiking, you may wish to skip this attraction. 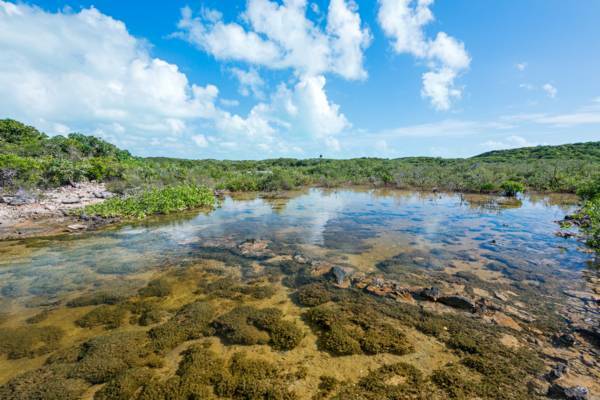 Found in the Heaving Down Rock region on the eastern point of Providenciales, the Bird Rock area offers scenic and tranquil wetlands and coasts. The terrain here is mixed between low limestone bluffs, mangrove water ways and tidal marine marshes. 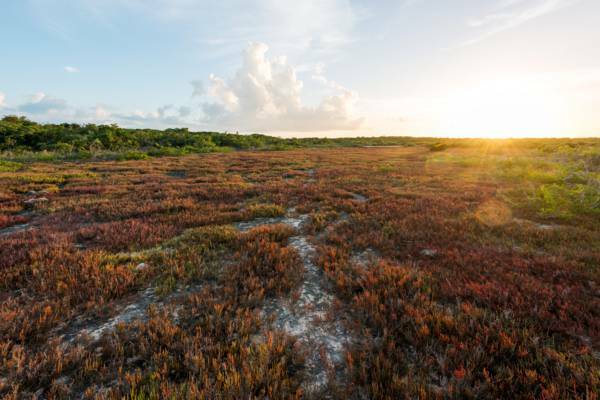 It’s a fascinating eco-system, and a great location to see many of the unique saline-resistant plants common to the country’s wetlands. The tidal flats at Bird Rock Trail, Providenciales. Off the extreme east point (Crist Point) of Providenciales, the tiny cay of Bird Rock can be seen close off the low cliffs. A small navigation light tower stands on the rock. From the high ground near the point, it’s possible to see the circular pens of the Caicos Conch Farm in the shallow water to the west. In 2014, the Turks and Caicos National Trust cleared a hiking trail to the point. This path initially leads through low drought-resistant coastal vegetation, but does break out into the interior wetlands after about .55 miles (.9km). Total distance to the point is .8 miles (1.3km). Disregarding the typically high temperatures and intense sun of the Turks and Caicos, the trail is not strenuous. The area is also a great location for birdwatching. Green herons, Antillean nighthawks, bananaquits, ospreys, doves, mangrove cuckoos and other species frequent the area. Unfortunately, it’s difficult to find the trailhead as there’s no signage. See the map below for access information. Due to abrupt turns and narrow sections, the trail is unsuitable for bicycles. The Bird Rock region of Providenciales can have serious mosquito and sand flea problems at times. If such conditions exist, it's advised to return at a windier time. A stepping stone causeway on the Bird Rock Trail. The Turk and Caicos Islands are primarily limestone, and limestone can present in a tremendous variety of textures and terrains. Depending on the levels of lithifications, Karst activity, and erosion factors, the appearance of the coastal rock in the country ranges from the intricate and rugged features seen at the Crossing Place Trail, to the soft bluffs of South Caicos and the east side of West Caicos. The coasts at Bird Rock Trail displays its own diversity of geology. As the sediments that later lithified into limestone initially collected, they were left in various patterns by the wave, wind and water actions. The three prominent limestone cross-bedding patterns, plane, dune, and herringbone, can be seen on the cliff faces. Another interesting feature is evidence of boulders piled by a major storm. The Bird Rock Trail is located on the shallow Caicos Banks side of Providenciales, and as such does not typically experience the large waves and swells that coast near deep water may encounter. This suggest that an event such as a significant hurricane may have caused the changes. The start of the Bird Rock Trail is found hidden on the side of the road here. Last reviewed by an editor on 11 February 2018.